This super saver Club Root Resistant Brassica Seed Collection consists of 5 seed packets of our best Club Root Resistant varieties, giving you a saving of £2! Cabbage Kilaton AGM F1-Summer/Autumn Cutting ball-head variety- If club root is a problem with brassicas in your garden, this is a 'must grow' cabbage for Kilaton F1 is resistant to the scourge. A Dutch white type, it gives solid, high quality heads which are great for coleslaw or cooked. Heads 2.5-4kg. Cabbage Lodero F1-A first red clubroot resistant variety! Produces tightly packed small to medium sized heads which are full of flavour and store well. Excellent in coleslaw or steamed where it retains its colour well. 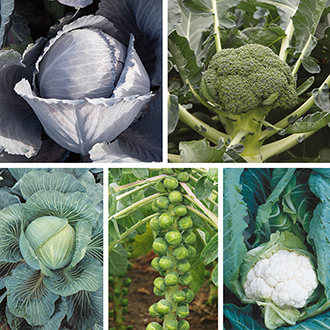 Broccoli Monclano F1 Seeds-this quality club-root resistant variety produces firm, domed heads with fine beads. It is high yielding and has good resistance to downy mildew which also gives it good standing ability. Brussels Sprout Crispus F1 Seeds-If clubroot is a problem in your veg plot, this early to mid-season hybrid is for you as it is highly resistant. The dark green buttons stand in good condition on the tall plants for several weeks. Cauliflower Clapton F1 Seeds-Club root a problem? Not with Clapton F1, which is resistant. This late summer and autumn cropper gives heavy, dense, very white heads of superb quality and flavour. A real breakthrough.